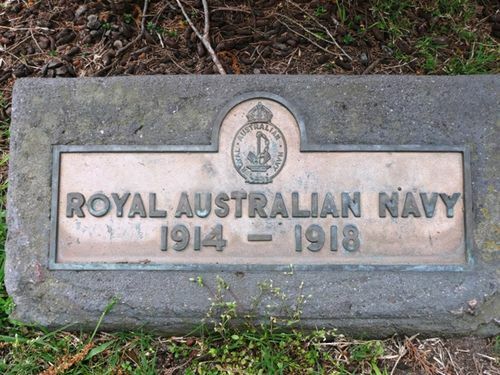 A plaque commemorates the service of the men and ships of the Royal Australian Navy during World War One. At the start of the war, the Royal Australian Navy was a small but formidable force, consisting of 3,800 personnel, 16 ships including the battlecruiser Australia, the light cruisers Sydney and Melbourne, three destroyers and two submarines.The light cruiser Brisbane and three destroyers were under construction, and a small fleet of auxiliary ships was being maintained. The RAN served under the British Admiralty in diverse areas of the world, including German New Guinea, the Cocos Islands, East Africa and the Dardanelles. Ships of the Royal Australian Navy also assisted the Royal Navy in the blockade of the German High Seas Fleet.